Back in October, we profiled a group of Lower School students who had established the first-ever Lumo Play Club at CDS. We recently revisited the students to see what they’ve been up to - and, wow, were we impressed! The Lumo Play system is located in the Illumination Room of the Lower School DREAM Lab. Lumo Play is software that turns any digital display, from TVs and flatscreens to projectors, into an interactive experience. At CDS, Lumo Play is projected onto the floor, and students can interact with the software to play math and reading games or just have fun during indoor recess. 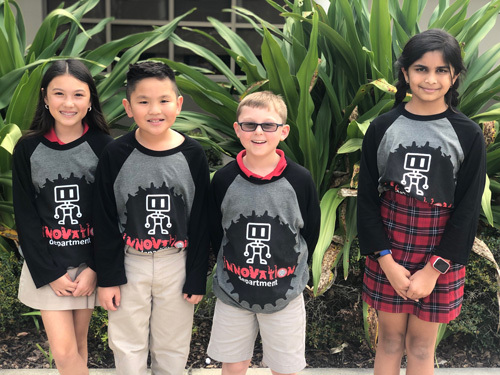 Four enterprising fourth graders – Allison, Kobe, Shreya, and Wyatt - have been meeting with Lower School Innovation Specialist Tanya Layton during recess to develop their own Lumo Play games. Meghan Athavale, the creator of Lumo Play with whom the children had Skyped earlier in the year, altered the existing templates to make it easier for kids to navigate (the original templates were not designed to be “kid friendly,” but Mrs. Layton and Ms. Athavale both had confidence in our students’ vision and ability!). Together, these students designed four new games to be enjoyed by the CDS community: a hockey game, two basketball games, and a particle flip game. Ms. Athavale was so impressed by the outcome that she asked to interview the children about their learning process to provide critical feedback to Lumo Play, with the intent of making the creation of games more kid-friendly. Thanks to our four students, Lumo Play game design will now become more accessible to students across the globe! All four of their games have been published in the DREAM Lab for our school to enjoy. Below are videos that showcase the games, as well as ideas and feedback that the students shared with the creator of Lumo Play. We know you’ll be as excited by their passion as we are!